UK - HSL supplied lighting and LED screen to the UK leg of the new You Me At Six "Cavalier Youth" tour, featuring an inventive lighting design by Louis Oliver who has worked with the indie rockers for the last five years, in which time they have steadily gained a solid live fan base and a cult following. It's the first time that Oliver - whose other current clients include Plan B, Chvrches and Five Seconds of Summer who just hit number one in the UK charts - has worked on a full production tour with HSL as a supplier. His account was project managed by the inimitable Mike Oates. Oliver discussed various visual concepts ahead of the tour with tour manager Mike Finn and the band’s documentary videographer Tom Welsh. 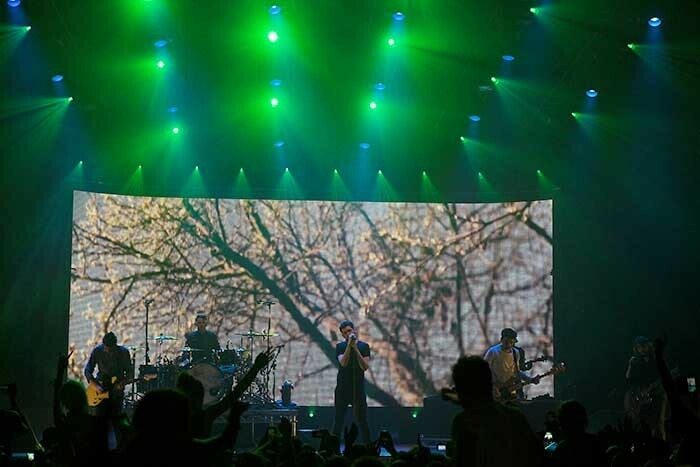 The band wanted a ‘video look’ to the stage, and as Oliver wanted to make a bit of a statement with this, they decided to go for a high-impact upstage screen, choosing a 40 ft wide by 15 ft high Martin LC 20 surface. The screen was hung in a slight curve to give additional depth. The video content, which ran throughout most of the set, was created by Oliver and Welsh. It’s an interesting mix of re-edited and re-worked documentary footage from the band’s extensive archive … together with new material produced for the tour. All this was programmed into two Green Hippo Hippotizer 'stage' media servers which were timecode controlled and fired via Oliver's grandMA2 light console. Oliver also had control of four lipstick cameras via the grandMA2, strategically positioned around the stage and fed into the Hippotizer. These IMAG images were used sparingly during the set to contrast with the playback footage and create a dynamic interplay between live IMAG and prerecorded live footage of the band. Oliver’s design brought characteristic style and finesse to the stage together with a bit of an edge. The main overhead lighting structural elements were six 20 ft long upstage / downstage trusses or 'spines', made out of some of HSL's Low-Pro pre-rigged trusses, chosen because they would be super quick to rig each day. There were also two 10ft front trusses house left and house right, with four MAC Viper profiles on each which were utilized for key lights in conjunction with four Clay Paky Sharpy Washes per side on the floor. 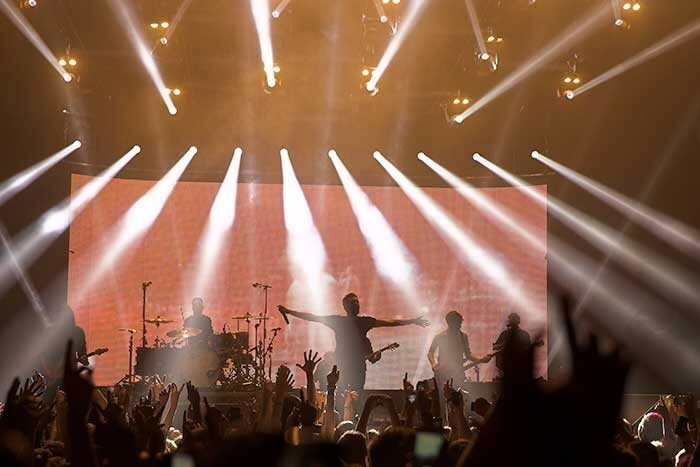 The low level cross stage beams from the Sharpy Washes was an essential element of the front lighting for the band’s lively and animated set which is full on from start to finish! The rest of the moving lights included 37 Robe Pointes and 26 Sharpy Washes positioned primarily on the spines, with nine of the Pointes on the floor beneath the screen at the back. These were augmented with 28 Atomic Colours, 18 on the spines. You Me At Six’s hi-energy performance is ideal for strobing and fast iris lighting effects – an area where the Pointes excelled. He really likes the Pointes for their multi-functionality and used them extensively in both spot and beam mode throughout the set. On the Sharpy Washes he appreciates the brightness, and had a special dimmer curve in the console so they could be run at around 30-40 %. The MAC Vipers he found to be excellent key lights with enough power to hold their own against the screen which output a serious amount of lumens at the back. HSL supplied two crew including Nick Burlace who was brought onboard at Oliver’s request to be the crew chief. Commenting on working with HSL he said: "It's been great, the kit is in excellent condition and Mike has been amazing in ensuring that we have had everything we needed."